Inside modern cell phones are billions of nanoscale switches that flip on and off, allowing the phone to function. These switches, called transistors, are controlled by an electrical signal that is delivered via a single battery. This configuration of one battery to power multiple components works well for today's technologies, but there is room for improvement. Each time a signal is piped from the battery to a component, some power is lost on the journey. Coupling each component with its own battery would be a much better setup, minimizing energy loss and maximizing battery life. However, in the current tech world, batteries are not small enough to permit this arrangement—at least not yet. Now, MIT Lincoln Laboratory and the MIT Department of Materials Science and Engineering have made headway in developing nanoscale hydrogen batteries that use water-splitting technology. With these batteries, the researchers aim to deliver a faster charge, longer life, and less wasted energy. In addition, the batteries are relatively easy to fabricate at room temperature and adapt physically to unique structural needs. 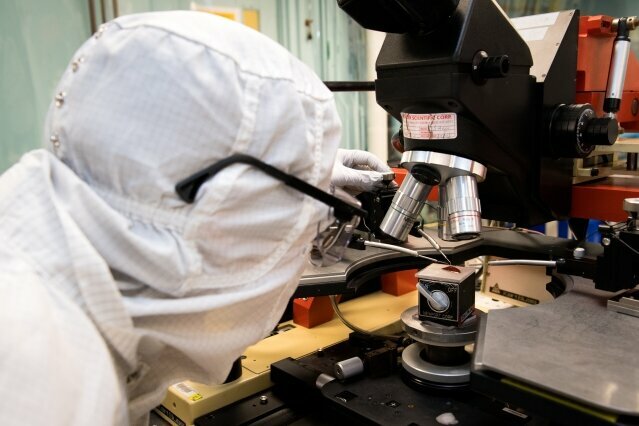 "Batteries are one of the biggest problems we're running into at the Laboratory," says Raoul Ouedraogo, who is from Lincoln Laboratory's Advanced Sensors and Techniques Group and is the project's principal investigator. "There is significant interest in highly miniaturized sensors going all the way down to the size of a human hair. We could make those types of sensors, but good luck finding a battery that small. Current batteries can be round like coin cells, shaped like a tube, or thin but on a centimeter scale. If we have the capability to lay our own batteries to any shape or geometry and in a cheap way, it opens doors to a whole lot of applications." The battery gains its charge by interacting with water molecules present in the surrounding air. When a water molecule comes in contact with the reactive, outer metal section of the battery, it is split into its constituent parts—one molecule of oxygen and two of hydrogen. The hydrogen molecules become trapped inside the battery and can be stored until they are ready to be used. In this state, the battery is "charged." To release the charge, the reaction reverses. The hydrogen molecules move back through the reactive metal section of the battery and combine with oxygen in the surrounding air. So far, the researchers have built batteries that are 50 nanometers thick—thinner than a strand of human hair. They have also demonstrated that the area of the batteries can be scaled from as large as centimeters to as small as nanometers. This scaling ability allows the batteries to be easily integrated near transistors at a nano- and micro-level, or near components and sensors at the millimeter- and centimeter-level. "A useful feature of this technology is that the oxide and metal layers can be patterned very easily into nanometer-scale custom geometries, making it straightforward to build intricate battery patterns for a particular application or to deposit them on flexible substrates," says Annie Weathers, a staff member of the laboratory's Chemical, Microsystem, and Nanoscale Technologies Group, who is also involved in the project. The batteries have also demonstrated a power density that is two orders of magnitude greater than most currently used batteries. A higher power density means more power output per the volume of the battery. "What I think made this project work is the fact that none of us are battery people," says Ouedraogo. "Sometimes it takes somebody from the outside to see new things." Currently, water-splitting techniques are used to generate hydrogen for large-scale industrial needs. This project will be the first to apply the technique for creating batteries, and at much smaller scales.